Before we begin, I must stress that this strategy will only work for established websites. Forget what most SEOs tell you, you do not need a million backlinks to rank for competitive terms. We have seen time and time again websites creeping up the search results with only 300 referring domains, going up against titans with tens of thousands of referring domains!. SEO isn’t complicated although most people make it appear far more complicated then it actually is. You don’t need large excel sheets, fancy python scripts or even a crawler to prepare a successful strategy. What you need is common sense and understanding of user-intents. When you see the screenshot above, what do you see? this page ranks number 1 for the generic and competitive keyword ‘Dresses’ in the UK. Although some of the above is an acceptable approach. It is all a distraction from what are the core strengths of this page. Let’s take a closer look. 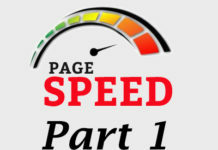 This page has 3, very important elements which are often missed by SEO’s. All SEOs know that if you want to target a keyword, you must have it in your page title and H1 heading. This goes without saying. However, their’s more to it then just that. The keyword we want to target is featured in the page title once. Yes once at the beginning of the page title. The second part is technically targeting a different keyword, in this case ‘Women’s Dresses Online‘. Although yes it is relevant, it isn’t 100% relevant to the keyword we want, therefore if we didn’t have ‘Dresses’ on it’s own at the beginning. This page would of lost about 5-10% of it’s ability to rank for ‘Dresses’. Naturally, to a human the above page title target’s Red Dresses, right? well search engines are not humans. ‘Red Dresses’. ‘Online Dresses’ is not as relevant as ‘Dresses’. 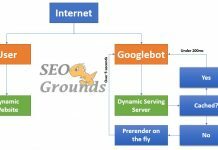 Therefore, it is vital that you have your exact keyword that you want to target in your page title, separated by a symbol such as a pipe, hyphen etc. This is also true for your H1 heading. Make sure your H1 heading says exactly what you want to target. No brand, ‘online’ or any other keywords mixed within it. Most if not all high ranking e-commerce websites use this technique without even realising. When you are targeting a competitive, generic keyword, user-intent and internal links is the most important part of the SEO strategy. Let me elaborate. A user searches for ‘Dresses’, what are they looking for? technically speaking that user hasn’t specified what their user-intent is, all we know it’s related to dresses. And Google knows this better then anyone. This means landing pages which meet a variety of different user-intents related to dresses will be favoured. And the list goes on, by doing this Pretty Little Thing are targeting a variety of different user-intents, strengthening their page for ‘Dresses’. 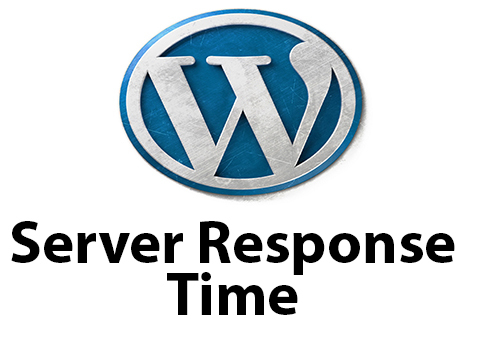 Remember, it isn’t only about the links coming into your page, the links going out are just as important!. Tip: when reviewing if a website links out to different user-intents, don’t forget to check the faceted navigation. Some websites leverage the faceted navigation instead of site-links under the main banner copy. SEOs usually don’t focus on the product names when ranking for product names is not a priority. 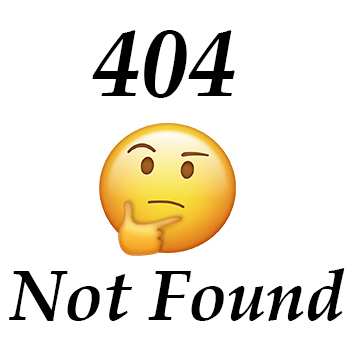 However, this is again is one of the most often overlooked elements of SEO. Similar to point 3 around internal linking and user-intent, the product names need to be highly relevant to your page. For example, if you wanted to rank number 1 for ‘Maxi Dresses’ your products should contain ‘Maxi Dress’ within the product name. It all comes down to relevancy and algorithms can’t detect from images what is and what isn’t a maxi dress. Therefore, always ensure your products contain the name of your category page. Many E-commerce have conflicting pages and most, under estimate how damaging this can be to organic performance. So what is a conflicting page? a conflicting page is a page that appears to target the same keyword as your primary page. Naturally most SEOs would do a site-crawl to find these pages. However, their is a much quicker and more effective tool. Google, is the best tool for this. Using the same ‘Dresses’ example on Pretty Little Thing, you would Google the following. 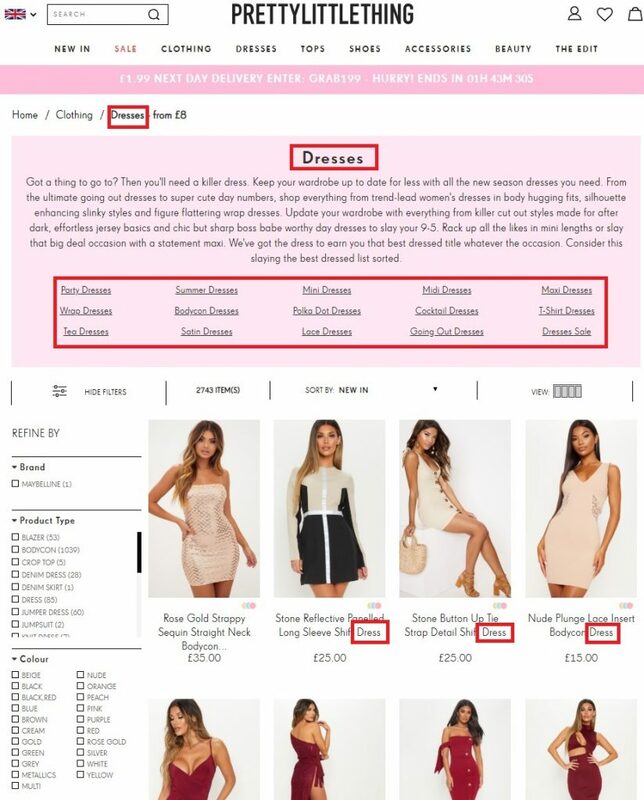 What you are looking for here is pages that target the keyword ‘Dresses’, ignore pages such as ‘New Dresses’, ‘Sale Dresses’ etc as technically these target different keywords!. You will usually find all your conflicting pages on the first page and you are using Google’s own algorithm to identify them! The above will indeed help you rank for dresses, however in order to outperform all competitors and ensure you stay above everyone else we must optimise deeper. Your site structure should look something similar to this. Each page, links to highly relevant pages which contain your keyword within it. For example, on the Maxi Dresses page we are linking out to ‘black maxi dresses’, ‘Petite Maxi Dresses’ etc as seen above. This will allow search engines to understand how relevant your website is on ‘Dresses’ by optimising multiple levels deep. Furthermore, the structure above doesn’t only benefit Google, it benefits users. 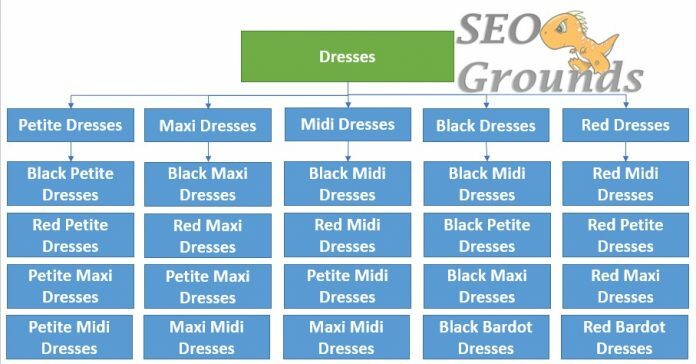 A user on the Maxi Dresses page is clearly looking for a Maxi Dress, therefore we are providing them with many different options related to what the user wants thus improving the overall user-experience, conversion rate and organic performance.